Bill Murray — who very rarely does interviews — does one. And it’s great. Everything that makes Bill Murray…well, Bill Murray!… comes out in this interview in GQ. Read it now. Because he is very very unlikely to do another one for years. 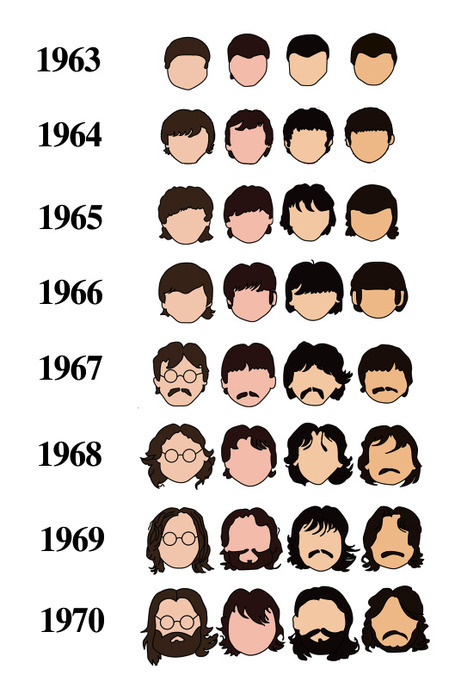 The History of The Beatles as told by their hair can be found at the always inventive FlowingData web site. Can you guess which head belongs to which Beatle? It’s remarkable how much the Beatles changed their looks in such a short period of time. If you have seen and loved “Inception”, you might want to go back and see Blade Runner: Final Cut. In many ways, there is not much difference between the “Director’s Cut” and the “Final Cut”. Ridley Scott lengths some scenes slightly, and there are some small additional scenes (like the strippers in the bar). As well, he cleaned up some things (e.g. visible wires). I recommend the Final Cut, especially if you have only seen the original version of the film with the voiceovers. Most guidance from writers for writers is worse than useless. I am not sure if they are trying to be clever, mystifying, or stupid with the guidance they provide, but the conclusion you are lead to is that it is impossible to give good advice to other writers. That’s simply not true, for if it were impossible to give guidance to writers, there would be no “Elements of Style”. Fortunately there are writers who show it is possible to provide good advise. You can find it here in the LA Times: Janet Fitch’s 10 rules for writers. Anyone who writes, be it for fiction or simply email, can benefit from reading this. You may think that computers are doing little if anything while you are sleeping. While you are dreaming, you might think, if you think of it at all, computers are sitting mostly idle, running the odd screensaver program, waiting for you to return, your faithful servant. Of course, some computers, like web servers, could be serving different people. Computers could be handling the requests from people around the world who are awake and working and reading and surfing the web. Some computers handle requests 24 hours a day, rarely having any time to themselves, to reboot, to load new software.They process requests until they are shutdown intentionally or fail dramatically. But just like your body is resting and your brain is dreaming/sorting things out in the wee small hours of the morning, so too do some computers take the night time to get themselves together. While you are sleeping, they are running backups, processing files they don’t get to process in the daytime, defragmenting their disks, cleaning out their caches and buffers. Many computers have utility roles, doing a myriad of tasks you can only imagine. Plus for every set of computers handling your requests, there are entirely different sets of machines that check and make sure that the machines you use are working properly. If the earth can be said to be automatic, so too can it be said of the many thousands of computers that are running while you are sleeping, running to keep the world running in the 21st century. And I have thought of all this while I test run batch programs on a set of test computers during the graveyard shift, in order to insure that the real computers that we run can handle the volume of requests that the real (not test) computers will eventually have to handle. For in my case, what computers are doing while you are sleeping are helping me do my job successfully which will help you in ways you don’t even know (not only, but partially, because you are sleeping). And parents – children playing in the water make noise. When they get quiet, you get to them and find out why. If you have the slightest doubt, save them first, and let them complain later that they weren’t drowning and you were overreacting. This explains alot, actually. From Flavorwire » Awesome Infographic: Hipster Fashion Cycle, and found via SwissMiss.